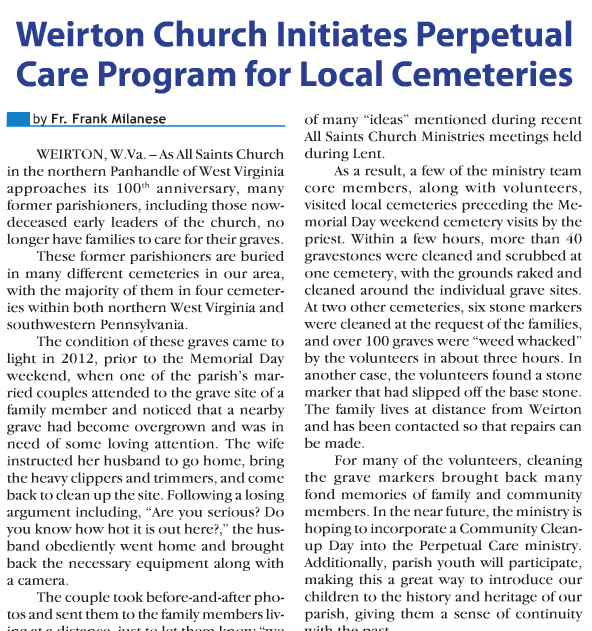 Weirton, W. Va. - As All Saints Church in the northern Panhandle of West Virginia approaches its 100th anniversary, many former parishioners, including those now-deceased early leaders of the church, no longer have families to care for their graves. These former parishioners are buried in many different cemeteries in our area, with the majority of them in four cemeteries within both northern West Virginia and southwestern Pennsylvania. The condition of these graves came to light in 2012, prior to the Memorial Day weekend, when on of the parish's married couples attended to the grave site of a family member and noticed that a nearby grave had become overgrown and was in need of some loving attention. The wife instructed her husband to go home, bring the heavy clippers and trimmers, and come back to clean up the site. Following a losing argument including, "Are you serious? Do you know how hot it is out here? ", the husband obediently went home and brought back the necessary equipment along with a camera. The couple took before-and-after photos and sent them to the family members living at a distance, just to let them know "we care." The very thankful response became the seed that grew into our Perpetual Care ministry for those members unable to care for their loved ones either due to old age, poor health, or living at a distance. . . .
As a result, a few of the ministry team core members, along with volunteers, visited local cemeteries preceding the Memorial Day weekend cemetery visits by the priest. Within a few hours, more than 40 gravestones were cleaned and scrubbed at one cemetery, with the grounds raked and cleaned around the individual grave sites. At two other cemeteries, six stone markers were cleaned at the request of the families, and over 100 graves were "weed whacked" by the volunteers in about three hours. In another case, the volunteers found a stone marker that had slipped off the base stone. The family lives at a distance from Weirton and has been contacted so that repairs can be made. For many of the volunteers, cleaning the grave markers brought back many fond memories of family and community members. In the near future, the ministry is hoping to incorporate a Community Cleanup Day into the Perpetual Care ministry. Additionally, parish youth will participate, making this a great way to introduce our children to the history and heritage of our parish, giving them a sense of continuity with the past. For the little time and effort this activity took, the benefits to families and the extended community members will be felt for a very long time.